The Department of Justice on Friday announced a proposal to ban bump stocks – the devices used in last year’s Las Vegas massacre. Bump stocks are devices that can be installed onto semiautomatic rifles, accelerating the gunfire. President Donald Trump has repeatedly blamed the Obama administration for a 2010 ruling that found that bump stocks weren’t technically “machineguns” and therefore couldn’t be banned. The Trump administration announced a new proposal on Friday to effectively ban bump stock devices, which were used to accelerate the gunfire of the Las Vegas mass shooter last year. 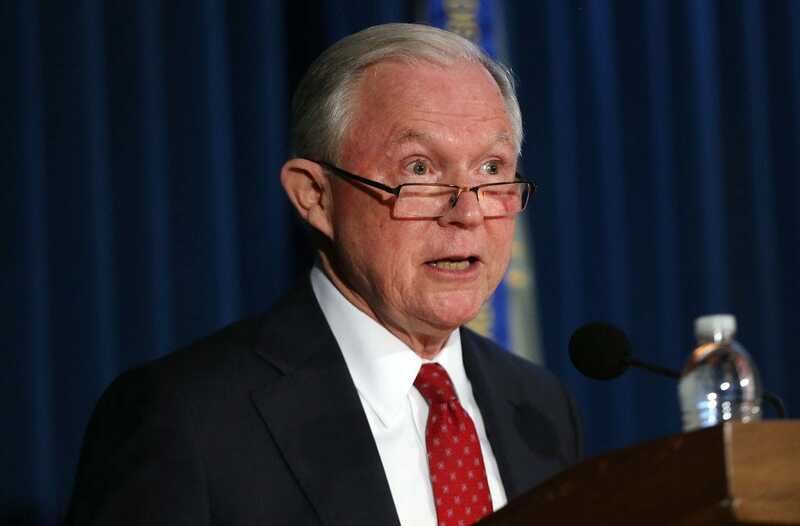 Attorney General Jeff Sessions said in a statement that the Justice Department intends to amend a regulation from the Bureau of Alcohol, Tobacco, Firearms and Explosives to ensure that bump stocks fall under the definition of a “machinegun” under federal law, thereby banning the devices. President Donald Trump weighed in on the decision on Twitter, blaming the Obama administration’s ATF for ruling in 2010 that bump stocks didn’t fall under the “machinegun” definition. The Justice Department’s statement on Friday also indicated that if the proposal is adopted, people who currently own bump stocks would have to give them up or destroy them. “If the [notice of proposed rulemaking] is made final, bump-stock-type devices would be effectively banned under federal law and current possessors of bump-stock-type devices would be required to surrender, destroy, or otherwise render the devices permanently inoperable,” the statement said. Spencer Platt/Getty ImagesAttorney General Jeff Sessions. A bump stock is a device meant to be installed onto a semiautomatic firearm, such as AR-15, AK-47, and Saiga models, replacing the rifle’s standard stock. Unlike automatic firearms, which fire continuously while the trigger is pulled, semiautomatic weapons fire one round per trigger pull. But the bump stock harnesses the recoil energy produced when a shot is fired from a semiautomatic rifle to “bump” the weapon back and forth between the shooter’s shoulder and trigger finger. Since the shooter is still pulling the trigger for each shot, federal officials previously argued that the firearm technically remains semiautomatic, even as it achieves a rate of fire similar to that of an automatic one. The Trump administration has been reviewing the legality of bump stocks since December 2017. Shortly after a mass shooting at a Florida high school on February 14 this year, Trump issued a memorandum directing the Justice Department to craft a rule that would ban the devices.